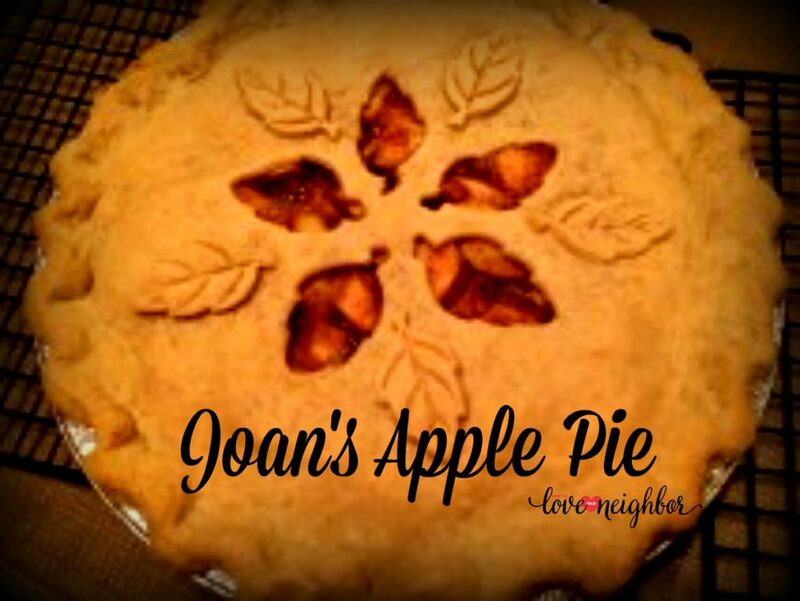 I met Joan through this ministry, and she often sends me endearing emails about her neighbors. She and her husband have chosen their home because of the needs of their immediate neighbors and their community. 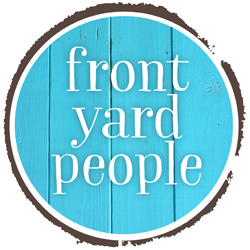 They are homeowners and landlords, active volunteers and kind, sincere folks who keep their eyes open for opportunities to serve. 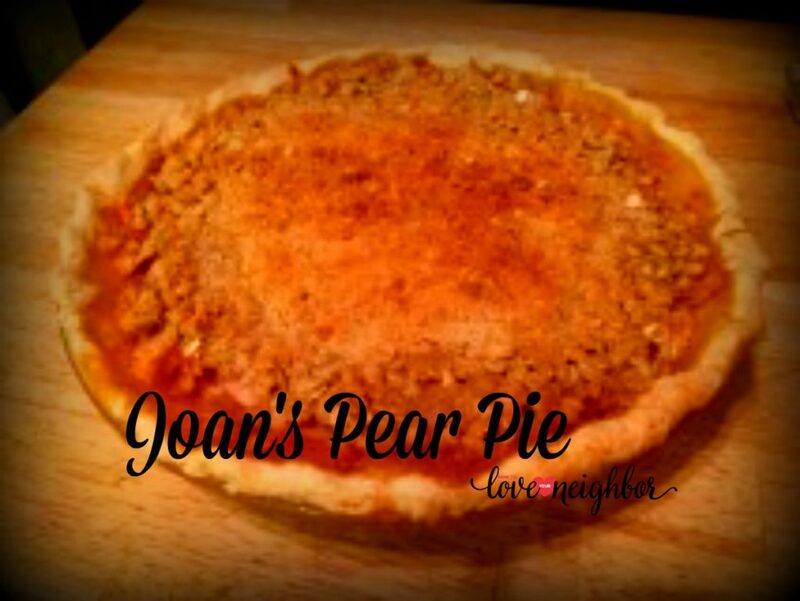 Joan attends city-wide meetings, block parties and visits her neighbors in their homes – often carrying one of her famous and sought-after pies! She shares her recipes with you in hopes you’ll be inspired to deliver some sweetness to your neighbors, too! In a saucepan, combine apples, water and lemon juice; cook over medium-low heat just until the apples are tender. Remove from the heat and cool (do not drain). 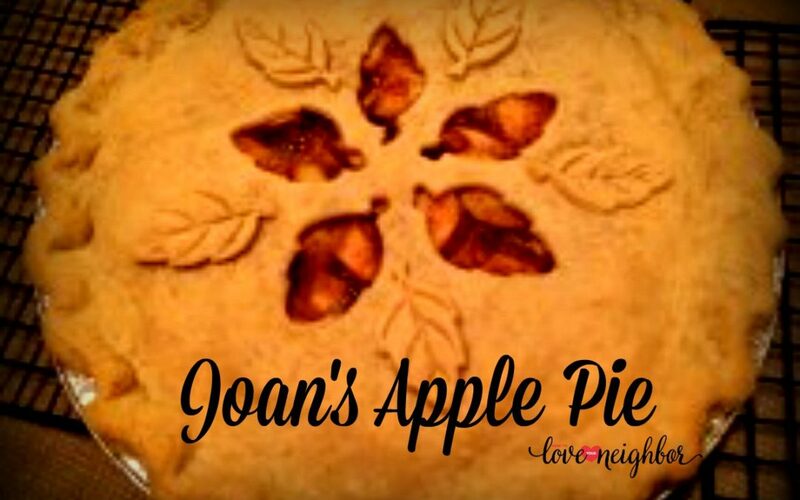 In a large bowl, combine sugars, flour, cinnamon, nutmeg, ginger and salt; add apples and toss to coat.Line a 9-inch pie plate with bottom pastry; trim even with edge. Add filling. Roll out remaining pastry to fit top of pie; place over filling. Seal and flute edges. Cut slits in top. Bake at 450 F. for 10 minutes. Reduce heat to 350 F.; bake 35-45 minutes longer or until golden brown. Cool on a wire rack. Yield: 6-8 servings. Note: I like to use a blend of apples. Sometimes I use half Granny Smith and half McIntosh. It all depend on what apples I happen to have on hand. This recipe can be doubled to make two pies. In a large bowl, combine pears and lemon juice. In another bowl, combine ½ cup sugar, tapioca, cinnamon, salt and nutmeg. Add to pears; stir gently. Let stand for 15 minutes. Pour into pastry shell. In a bowl, combine the oats, flour, and brown sugar. Cut in butter until crumbly. Sprinkle over pears. Cover edges of pie crust with foil. Bake at 450 F. for 10 minutes. Reduce heat to 350 F.; bake for 35-45 minutes or until crust is golden brown and filling is bubbly. Remove foil during the last 10 minutes. Cool on a wire rack. Yield: 6-8 servings. This recipe can easily be doubled to make two pies. Note: I used bartlett pears from an old pear tree that stands in the middle of town (Middleburg, PA) next to the house where I grew up. For best results, I like to make my pies the day before I plan to serve them. But I have been known to deliver a fresh warm pie to my neighbors from time to time. If they wait until the next day to eat it or if they eat it all up while it is still warm, it is up to them. Combine flour, sugar, and salt into the bowl of an electric mixer. Cut butter into tablespoon pieces; add it to the flour mixture. Use the paddle beater to cut the butter and flour together. With the mixer on low speed, pour in the cold water. When the dough just starts to clump, and before it turns into a ball, stop stirring. Lightly knead dough with your hand in the bowl until it forms a ball. Divide dough into two parts. Flatten each part into a disk, and chill for about 15 minutes before rolling.